Among the fun things to do at FunCity Burlington is Huck's Harbor, an indoor and outdoor water park. Regardless of the weather, you and your clan could don your bathing suits and enjoy the water slides and other wet activities at the climate-controlled indoor park. When the weather cooperates during the warmer months, the outdoor slides and attractions increase the opportunities to splash. By indoor water park standards, Huck's Harbor is quite small: only 20,000 square feet. The centerpiece at the converted indoor pool is an interactive water play station with sprayers, slides, and a dump bucket. The park also offers two water slides, Tom's Twister and the Red Rage, as well as a small lazy river, a wading pool, activities for young children, and a whirlpool. When the outdoor water park is open, the rides available include a bowl slide, a lazy river, body and tube slides, and Kiddie City Jr., a water play area for young children. There is also a wading pool and an activity pool. Neither the indoor or outdoor facilities offer any of the high-profile attractions found at larger water parks such as a water coaster or a funnel ride. Huck's Harbor is a good place to seek some relief from the summer heat or a respite from winter's woes, however. 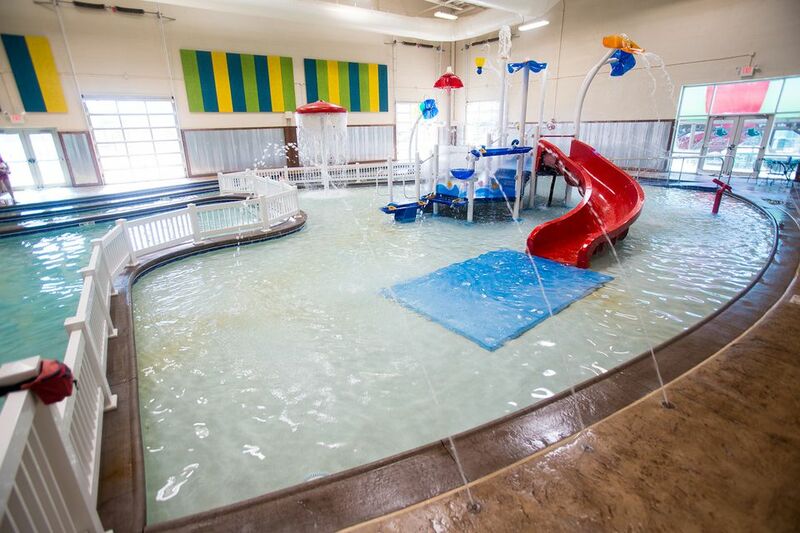 Indoor: Small water slides, interactive water play structure with dump bucket, activity pool, climbing wall, lazy river, wading pool, and hot tub. Outdoor: Lazy river, body slides, tube slide, an activity area for young children, activity pool. The park is open to registered hotel guests and the general public. Onsite hotel guests receive free admission to Huck's Harbor. 24 bowling lanes at Kingpins. Year-round electric go-karts at the 25,000-square-foot indoor Zoom. Sky Trail and Sky Tykes- indoor, overhead activity center with rope bridges and other challenges. Over 100 arcade games, including redemption-style games with prizes available. Ballocity, an indoor play area with cannons, vacuums, and all kinds of other ways for kids under 12 to blast each other with foam balls. Trax, a party room for birthdays and special events. Onsite dining includes The Boogaloo Cafe, a full-service restaurant, and sports bar, the full-service Edgewater Grille, the quick-service Club Car Lounge, and Gasoline Alley's, a diner-style eatery. The adjacent Pzazz Resort offers a variety of rooms, including some family suites, at the Pzazz Hotel and Catfish Bend Inn. Amenities and activities include the Catfish Bend Casino with slot machines, table games, and other gaming, the Spirit Hollow golf course, a spa, an event center with function space, and multiple restaurants. FunCity is at the intersection of Highways 34 (Mt. Pleasant Street) and Highway 61 (Roosevelt Avenue) in Burlington on the Mississippi River.